← Christmas Phase 2 Is Live! Hey there Ho Ho Ho’s. Jumping on in to offer some updates on one of the things we are seeing in the comments. 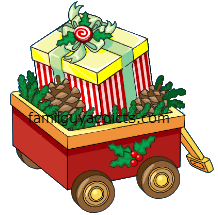 The MAIN one right now is the Gift Box lockouts. You wrapped and opened the boxes, but for some reason the Gift Box closed out and locked up before you could get all the prizes inside. This was reported to TinyCo, they are working on a patch, it will be out with the upcoming update. In the meantime…double check your Inventory all over just to make sure one of the prizes didn’t sneak in there. They are not in any order so it is easy at times to swipe right past them. Many players eager to just get the job done, did it so fast that the questline requirements were never triggered before you got done. In other words, players didn’t wait to get the walkthrough to clear one box before clearing all boxes. Now those same players are stuck and unable to clear the task to proceed on the questline. This issue was also reported, they are working on a patch. Will update once we get word on if it will be with the upcoming update too. In the meantime, we suggest other players to at least save one box of each to use for the questline progression so you do not run into it too. Hope this helps a lot of you out. Feel free to still write in to them just so you have a ticket open that you ran into the issue too. 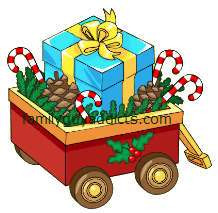 This entry was posted in Glitch and tagged Can't Open Gift Boxes, Didn't get all Gifts, Family Guy Addicts The Quest For Stuff, Family Guy Tips and Tricks, Gift Boxes Locked, Miracle on Spooner Street, Missing Items from Gift Boxes. Bookmark the permalink. i cant win the weekly prizes even though i was well above dream level and purchases all the items without spending cash.. Tiny co has not answered me at all. I have been locked out of the first gift box and I’m missing Chris’s drawing table. I downloaded the update and it did not fix it. I acquired enough supplies to get the last building to get Jasper, but was given something else rather than the last building twice. I was about to get the last piece needed to build the last building when Jasper left. Not happy about this. I may stop playing. Did you get the “free play” box? Or something else? My holiday gift box has disappeared and I don’t know why. I looked in different places on the holiday menu but I don’t see it. It goes away after you wrapped all the items inside. My striped and holiday gift boxes have disappeared. Like where household to to wrap them. I think that’s where I’m supposed to get items for my wish list (I have only two and I can’t figure out how to get more). I checked my inventory and nothing there. I have all these stockings and no way to spend them. What gives? They go when you got all the items inside. It will take all event to get all wish items as they are not just in one box. What part is preventing you from playing? What glitch did you have? Email them again. That is odd to go so long without even the autoreply message to make sure you still need help. Hi, was there a quest line for Hanukkah Mort? As soon as I finished the quest: “create Hanukkah Mort’s outfit and attack the Yeti” the quest line didn’t continue. No separate questline. He’ll have tasks continue during the main one. Speaking of glitches, does Hanukkah Mort’s Facespace profile pic appears as him flying away, slightly deformed, instead of his face for anyone else? I didn’t get the buildings to get Kaspersky because the boxes disappeared on me. I’ve already checked my inventory, so I know I didn’t get all the prizes. What am I supposed to do?? Message them. A patch is coming. I dont know how to message them. I don’t seem to receive the buildings that Jasper needs. Is it possible to get those buildings with the Striped Gift Box? Also: the Holiday Gift Box disappeared? And is it only possible to add friends by Facebook? Once you earn all the items in a box, it goes away. If you think you did not get all the items in that box, double check your inventory and if still nothing there …contact them from your game. Only FB friends for now. I have a question about secret santa gifts. I read somewhere on here that ollie will send you a gift everytime the tree is upgraded. I did not receive one during the last ugrade. Is this because I am connected to facebook and am eligible to receive presents from friends? Has anyone else experienced this? Yes. If you get FB friend gifts, there is no reason to have Ollie give you one. I wish there was a way to see who sent you a gift other than that box that pops up for a few seconds when you first load the game up. Games with longer loading screens always cause me to start doin something else in real life so if i dont happen to be looking i miss the message. Having said that however…. I opened my last snowflake gift box and got the snowy park. I had mr weed in the park doin his 24 hour task for cookies/HC. Once i opened the box for the park my Mr Weed seems to have vanished. He isnt listed in the park’s menu when i click it and all the other buidings i have clicked i dont see him in case I put him on another task by mistake. Ive flipped the park from regular to snow and nothing. I waited til the timer came up to collect the cookies and i removed the park and then placed it again and still no Mr Weed. I set him at the same time as Brian and he has 9 hours left so I guess we will see when that timer is up if he re appears. Other than that im dumbfounded as to what happened. anyone else had this happen? Also I figured if he was doin the task but invisible it would not let me put the park in storage as any occupied building refuses to let you do that when its being used like that. but it let me store it so there is that theory. Ok once Brian’s task was ready to pop i did a tap fest all over town. Somewhere in all of it Mr Weed was freed, so i have no idea what i had assigned him on cause I had clicked every building and didn’t see him in any of them. So its all good now for me. They could have saved all the headaches with this problem by making a constant drop from the boxes for the quest. That is to say make the quest required box, drop cookies and the needed stockings to do it again. That way if you get it before the box locks, you aren’t out anything but the time to wrap it. And if you get it after, you clear the quest and get back the stuff you invested. My wife is having an issue with Mall Santa’s not dropping dolls, and she still needs 2 gifts. Then have her write in to TinyCo directly from her game menu. I don’t like the idea of having gift boxes play a big part, and then having a silver gift box that requires clams camouflaged into the mess of check marks and coins. Too similar and I just used 75 clams thinking I was opening a normal gift box be careful you don’t do the same. I did it 3 times before I realized it! At least I got the gingerbread house. .. so I can’t be that mad. My game keeps crashing since the start of this holiday event. I have emailed them and was told the generic need to close out other programs and have enough RAM. I am not happy with this reply as it does not solve the issue. Umm… Sorry don’t know whare to post this but my games sound effects seem to gone and voices to. The only voice I can get is Peter for me my music works. So I don’t know what to do I would like some help thank you. Do you have any pictures of the Dizzy Reindeer? I think I was locked out of the Striped Gift Box before getting it, but I want to double-check and make sure I didn’t just place it somewhere and forget about it. Yay the snowflake box is back, now I can just relax and take my time, does anyone know what’s in it, I won all the items and it locked before getting to Pt 4 in the questline, but as I said it’s now back. They did that just so players stuck can get that questline part passed and not be stuck. So…something simple. Oh, I’m not mad at all. I went on a hot streak with the Silver Gift Box and banked about 800 clams before getting the last prize, so I’m fine with the 9 spent clams. I was just rushing it so I could pass along the answer to you and the other Addicts. I haven’t got to Pt 4 yet, I’m holding off till I’ve unlocked Hanakkah Mort so I can keep the streak going, but I’ve already won all the prizes from the Snowflake Mystery Box, do I need to do anything or just wait? If you never triggered the pop up to clear a box, but have none left to clear…they are working on a patch. So you will have no choice but to wait til it is corrected. Lol. Cheers Bunny, I just hope that they can patch it before the next Tree upgrade because I would hate to miss out on any cool content, I’ll just focus on getting Jesus for now then. Is there a glitch that causes my Christmas cookies to disappear? On my main screen it shows only 840 but when I go into the work shop its shows 5140 cookies next to the Holiday cheer level. 840 is your current amount (total minus what you’ve spent). This is the amount you have left to spend. 5140 is your running total. This number never reduces when you spend them, and is more of a way to track how many you’ve collected over the whole event. 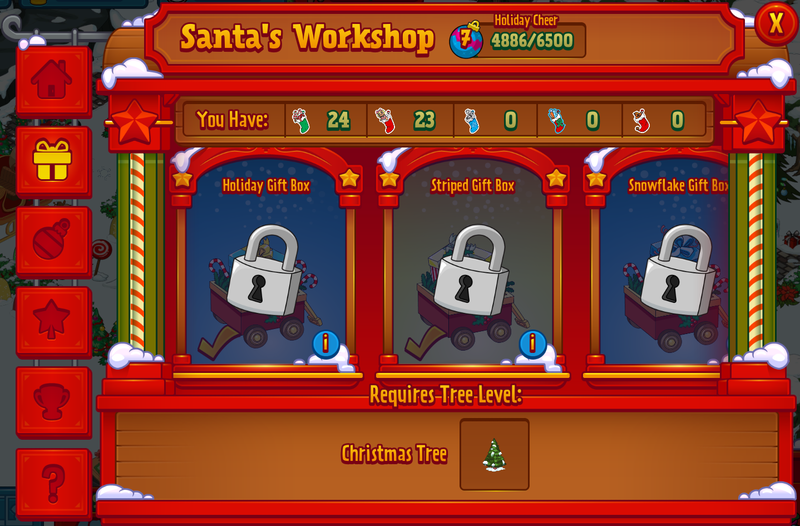 I just got Boyfriend 3000 ip from the striped box and there was still one more item, the Xmas Sock in there, but when I went to get it a minute later I was locked out, I don’t think its a needed item yet, but should I email my game info to you anyway? I had same question, but realized that they are correct. You pay 300 cookies to win 300 cookies, so it is a waste of time. So they locked it. I send a gift box to a friend but the friendnhasnt recieved it. I was just locked out of the striped box, with one prize left – the cookies. I had just gotten the dance studio, and then created Jasper. I did not rush through it, I have been claiming prizes for days. As soon as I created Jasper, the Holiday Cheer award leveled me up to the next Cheer level (5). Going back in, I notices the striped box was locked. I am not sure if creating Jasper, or leveling up, or something else was the cause of me me getting locked out unable to earn my last prize available to everyone else. They lock up when all the main prizes are one and only material left. That is normal. There is a bug though that is locking players out BEFORE they get all the main items, especially the Greek needed for Jasper. So you are saying that I loose the chance to get cookies that I can earn, based on a random event, what gifts the game randomly selects to give out first?? I can understand that it may take longer, but if I miss Jesus by 300 cookies I will not be happy! That doesnt seem very fair. OK I am an idiot. It would cost me 300 cookies to win 300 cookies. There would be no profit in winning. I don’t know why I didnt see that. The box should be locked…it is correct….I dont know why I didnt see that. Sorry to all for wasting your time. Thanks Bunny! I too was one of those eager players and decided to knock out all those prizes right away. Now I got the dialogue asking me to open the Snowflake box and am stuck. D’oh! (oops wrong game.. But still fitting). Which gift boxes should be unlocked? Only the snowflake one is unlocked for me. If you cleared ALL gifts (minus materials) from Holiday and Striped, then ONLY Snowflake will be open until you clear that one too.